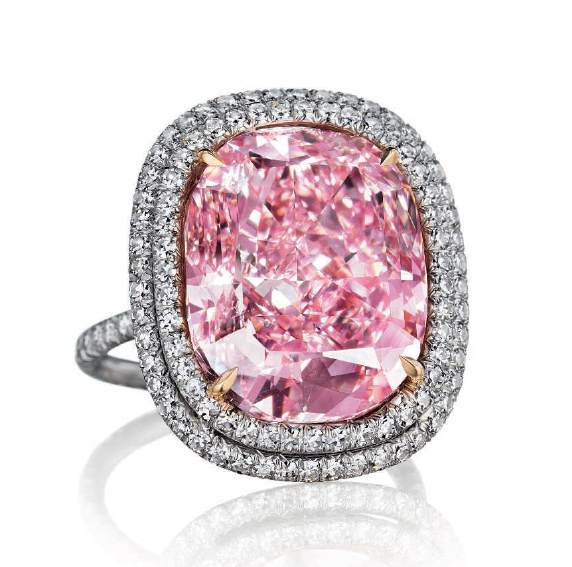 A huge diamond that would be magnificent enough at 16.08ct, however this extraordinary diamond is also graded as Fancy Vivid Pink, Flawless. Sold at auction in 2015 for a record breaking $28,5million, this incredible jewel was bought alongside an also record breaking blue diamond by Hong Kong billionaire for Josephine – his 7 year old daughter. All coloured diamonds are exceptional and beautiful in their own right. However this fabulous diamond, weighing 12.03ct sold at auction in 2015 to a Hong Kong billionaire who bought not only one, but two record breaking coloured diamonds as a gift for his 7 year old daughter – Josephine. 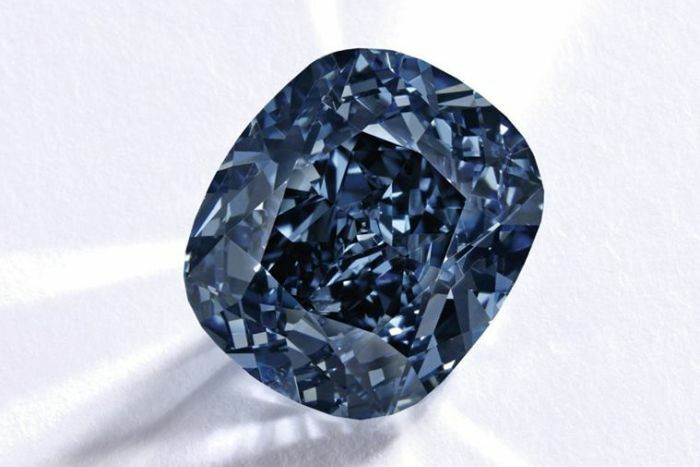 Paying out $48.4million made this the largest cushion shaped Fancy Vivid Blue, Flawless to be sold at auction. Perhaps the most famous of all diamonds, the Cullinan - though discovered 26th January 1905 - still holds the record for the largest white diamond ever recovered at an outstanding 3,106.75ct (621.35g) total rough weight. The Cullinan was faceted by the diamond cutting firm Messer I. J. Asscher of Amsterdamn in to 9 major and 96 minor stones. The two largest diamonds – Cullinan I and II – were chosen by King Edward VII to be set in to the ‘Imperial State Crown’ and the ‘Sceptre with the Cross’. The remainder of the diamonds were retained as payment by the cutters until the South African government purchased them and the High Commissioner of the Union of South Africa presented them to the Queen Mary on the 28th June 1910. Cullinan I – also known as the Great Star of South Africa - remains the largest faceted white diamond to this day, and can be removed from the sceptre and combined with Cullinan II to form an impressive brooch. The Queen’s Diamond Jubilee in 2012 made for an historical event, as for the first time in history 7 of the 9 Cullinan diamonds were showcased together in a special display during the “Jubilee Celebration” at Buckingham Palace. With a history dating back to 1722, the world largest known natural green diamond is known as the ‘Dresden Green’ and is displayed in the ‘New Green Vault’ at Dresden Castle. Incredibly rare as a natural colour anyway, the 41.00ct diamond is a Type IIa with a clarity grading of VS1. Due to the difficult nature of testing green diamonds for origin of colour, it is hoped that the Dresden will aide in developing a definitive test to be able to do so in the future. 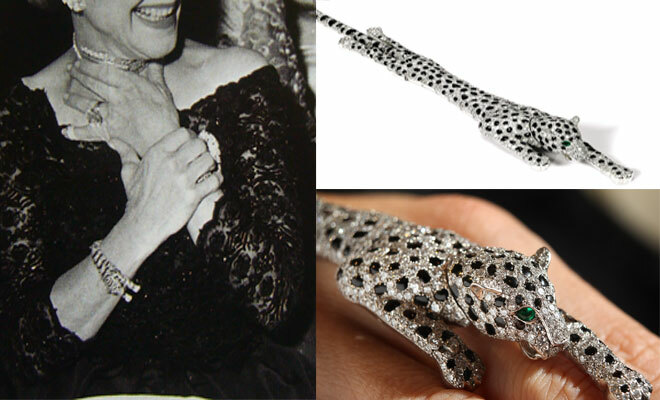 One of many pieces specially commissioned by the Duke and Duchess of Windsor, this hand crafted jewel was designed by Cartier’s designer Jeanne Toussaint in 1952. An iconic piece, the super articulated bracelet is fashioned to look like a panther, is made from platinum and set with hundreds of diamonds, onyx and completed by emerald accent eyes. Sotheby’s were chosen to sell the collection of twenty pieces in 2010, and this complex bracelet sold for an astonishing £4,5million. Circa 1900, this impressive jewel was commissioned by Count Heckel von Donnersmarck for his second wife Princess Katharina. This astonishing tiara is one of the most important ever designed. 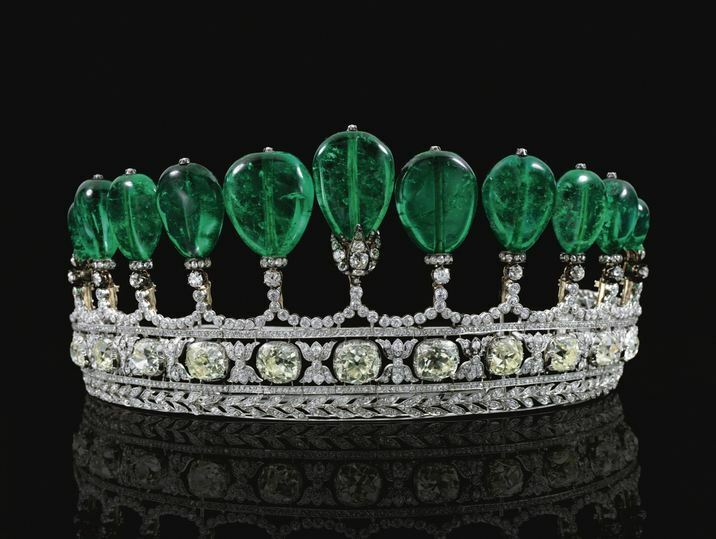 Though the exact origin of the eleven polished and drilled emeralds, totalling over 500ct, cannot be wholly confirmed, it is possible they were purchased during the Sotheby’s auction of the French Imperial Crown Jewels, France 1872. Although the tiara is unmarked, a few prominent jewellers were prevalent during this era and it is widely believed that the favoured Chaumet crafted this piece. The emeralds have been tested by renowned laboratory Gübelin Gem Lab (Switzerland) and have been assessed as natural Columbian emeralds with minimum clarity enhancement. In 2011 Sotheby’s sold this incredible piece for $12,7million. 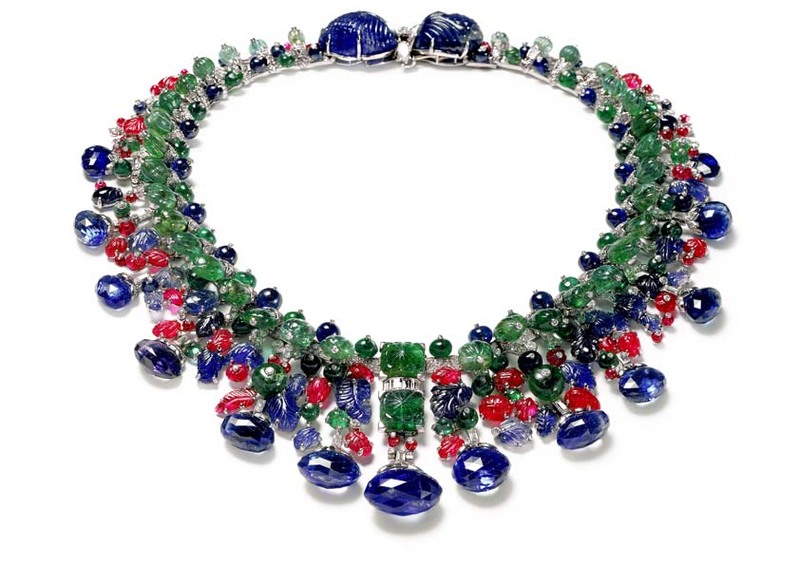 A special order 1936, this exquisite necklace kick started Cartier’s Art Deco phase. Requested by socialite Daisy Fellows, this theatrical piece is crafted in platinum and white gold, with: 146.9ct of briolette cut sapphires; marquise, baguette and old cut diamonds; two leaf shaped hand carved sapphires (93.05ct total); sapphire beads and cabochons; carved and polished emeralds and rubies. The original design had a black cord fastener, but in 1963 it was redesigned to incorporate the clasp you see today. A cushion shaped ‘pigeons blood’ ruby, weighing 25.59ct and named after the 13th century Sufi poet Rumi. 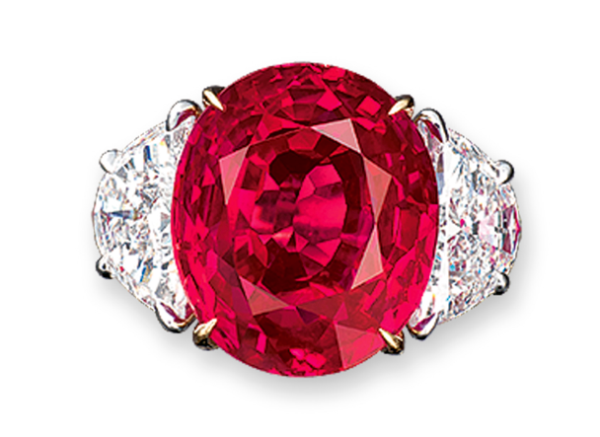 A gem from Cartier’s collection, the jewel is accompanied by two renowned laboratory reports (Gübelin and SSEF) stating the ruby was untreated and of Burmese origin. In May 2015 the ruby, set between 5.17ct of fancy cut diamonds in a fabulous three-stone ring design, was sold at Sotheby’s for a record crushing $30million. David Bennett, Sotheby’s is quoted as saying it’s “the most expensive coloured gemstone that is not a diamond” to have been sold at auction. The first fact about this jewel, is that it is not a ruby! It is in fact a spinel. One of the oldest jewels in the United Kingdom’s crown jewel collection, the 170ct irregular cabochon red gem dates back to the 14th century. Its name comes from the first 1367 English owner, Edward of Woodstock (the ‘Black Prince’). Nestled above Cullinan II in the Imperial State Crown, it was valued in 1820 at £10,000 which has a 2015 equivalent of £713,903!!! The reason for the incorrect name is simple. Up until 1783, all red stones were termed “rubies” or “balas rubies”. Discovered during the mid-16th century this history rich natural pearl weighs 223.8grains (55.95ct/11.2g). Presented to Mary I of England by the future Phillip II of Spain in preparation for their marriage. A beautiful portrait of her was painted by Antonis Mor in 1554, wearing La Peregrina as a pendant, and hangs in the Prado Museum, Madrid. After her death the pearl was returned to the Crown of Spain and it stayed as part of their crown jewels until 250 years later at which point Joseph Bonaparte took to the throne in 1808. The defeat of the French forces during the Battle of Vitoria led Bonaparte to flee France, taking some of the crown jewels with him. This led to the name “La peregrina” meaning ‘the wanderer’. Bonaparte left the pearl to the future Napoleon III – his nephew. Between 1870 and 1873 Napoleon sold La Peregrina to the (later) Duke of Abercorn for his wife. On two occasions the heavy pearl dropped out of its setting – once down the back of a sofa in Windsor Castle and another during a ball at Buckingham Palace! Of course, both times the pearl was found. 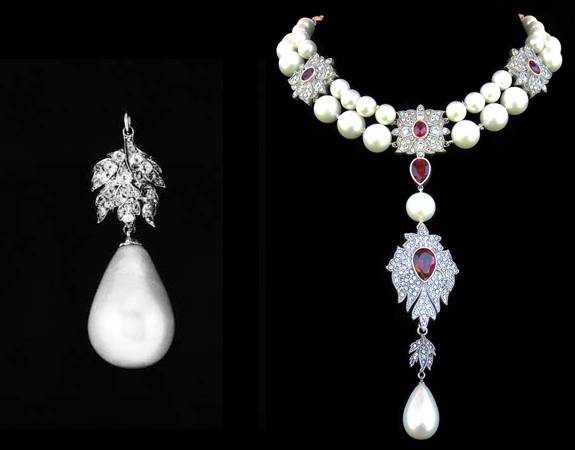 The Hamilton family retained ownership of the pearl until 1969 when they used Sotheby’s, London, to auction off the jewel. La Peregrina had already seen it’s fair share of drama by this point, but it’s best was yet to come as the Sotheby’s auction saw Richard Taylor purchase it for £37,000 – for his dear wife, ‘Liz’. Elizabeth Taylor, always full of life and excitement, lost the beautiful pearl hours within having it delivered to her suite only to find it being chewed on by one of her small dogs! While she writes in her memoir “My Love Affair With Jewellery” that “the most perfect pearl in the world was, thank God, not scratched” some rumours say that a small indent on the pearl came from the teeth of that puppy! The last tale of La Peregrina at this point, 2016, is it’s sale in 2011. An auction was held at Christies after Elizabeth Taylor’s death which saw her whole and beautiful jewellery collection sold. Expected to fetch $3million, the final price for La Peregrina, including fees, exceeded $11million. No doubt this is far from the end of the story for this mysterious jewel.